The $6bn Panama Canal Expansion is the largest project at the Canal since its original construction. The project will create a new lane of traffic along the Canal through the construction of a new set of locks, doubling the waterway’s capacity. The existing locks allow the passage of vessels that can carry up to 5,000 TEUs. After the expansion the Post-Panamax vessels will be able to transit through the Canal, with up to 13,000/14,000 TEUs. The expansion will double the Canal’s capacity, having a direct impact on economies of scale and international maritime trade. • Improvements to water supply. The Panama Canal expansion is based on six years of research, which included more than 100 studies on the economic feasibility, market demand, environmental impact and other technical engineering aspects. Works on the Panama Canal Expansion began on September 2007. Source: flickr.com/photos/briangratwickeThe 50-mile-long passage created an important shortcut for ships; after the canal was constructed, a vessel sailing between New York and California was able to bypass the long journey around the tip of South America and trim nearly 8,000 miles from its voyage. The canal, which uses a system of locks to lift ships 85 feet above sea level, was the largest engineering project of its time. Currently, the Canal serves more than 144 maritime routes, connecting 160 countries and 1700 ports across the world. The inauguration of the expanded Canal will take place Sunday June 26, 2016. The new waterway will provide greater economies of scale to global commerce as Neopanamax ships will be able to transit. The Panama Canal continues to provide the world, global commerce and individual segments with new products and services. The expanded Canal will double the tonnage of capacity in the waterway, increase reliability and cater to new segments. Earlier this month the container vessel COSCO Shipping Panama set sail from the Greek Port of Piraeus on its way to Panama to make history. The Neopanamax vessel will make its first commercial transit of the Expanded Panama Canal on Sunday, June 26, after a 14-day journey. Cosco Shipping Panama is a new vessel constructed and launched on January 2016. The Neopanamax containership is 299.98 meters in length and 48.25 meters in beam, and has a container carrying capacity of 9,472 TEUs. Originally named Andronikos, the vessel was renamed by China COSCO Shipping to pay respect to the people of Panama and for the honor of the inaugural transit. This ship was selected during a draw for the inaugural transit through the expanded waterway. Coincidentally, the ship was built in Hyundai Samho Heavy Industries Co., Ltd, the same company that constructed the valves that control the flow of water through the new locks of the Canal. Panamanian President Juan Carlos Varela and Panama Canal Administrator Jorge L. Quijano will be present on June 26 to deliver remarks and honour the dedicated workers who assisted in completing this colossal project. 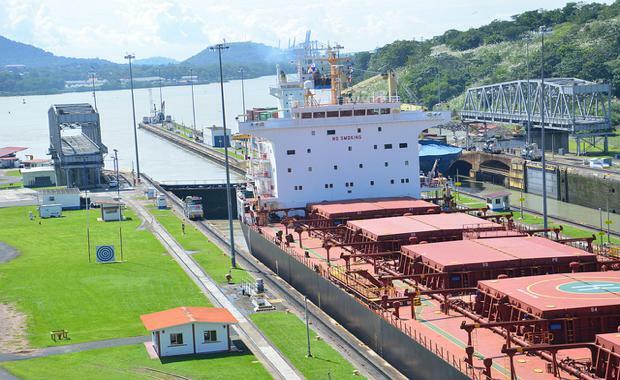 Earlier this week, the Panama Canal conducted a successful trial transit in the Expanded Canal. The transiting vessel, a U.S.-built crane ship named the Oceanus, was maneuvered through the Pacific-facing Cocoli Locks by Panama Canal Pilots Fernando Jaén and Ricardo Varela. Once inaugurated the Expanded Canal will double the waterway’s cargo capacity, enhancing the Canal’s efficiency, reliability and customer service. The new waterway will provide greater economies of scale to global commerce as Neopanamax ships will be able to transit. In line with its focus on customer service since the handover to Panama nearly 20 years ago, the Panama Canal continues to provide the world, global commerce and individual segments with new products and services.